Parkland X-C Ski Club takes avalanche occurrences and the risk of those occurrences very seriously. Since the early 1980’s it has been club policy to carry avalanche transceivers (beacons) and shovels on all back country trips where there are not groomed trails. It takes very little snow to bury a person, and since most avalanche victims die of suffocation not injuries, it behooves all back country travelers to be able to get to their friends as soon as possible. It has been shown that there is a 90% survival rate for victims recovered in 15 – 20 minutes or less. Our club policy states that all tour leaders have current first aid training and be trained in the use of the avalanche transceivers. 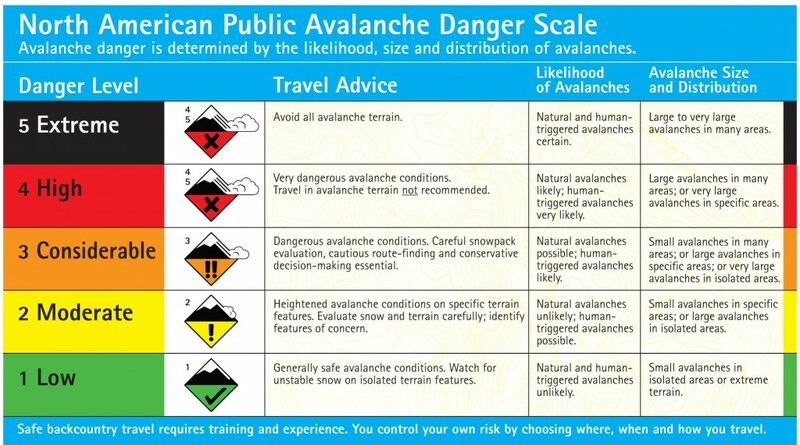 As a group we attend avalanche seminars and have two members trained by The Canadian Avalanche Association. These two members conduct annual retraining for other members, including locating multiple buried beacons. We also provide training for our skiers in general to acquaint them with the beacons and search procedures. As part of this short course is a basic study of snow dynamics and the setup (natural) that is required to produce avalanche conditions. The courses involve classroom and field trip time. Simple (Class 1) Exposure to low angle or primarily forrested terrain. May involve avalanche runout zones. No glacier travel. Challenging (Class 2) Exposure to well-defined avalanche paths, starting zones or terrain traps. Some crevasse hazards on glaciers. Complex (Class 3) Exposure to multiple overlapping avalanche paths or large expanses of steep, open terrain. Complicated glacier travel. Rescue Dynamics Mountain Weather Forecast Links Pagehttp://www.rescuedynamics.ca/wx/weather.htm A huge page of links developed by Rescue Dynamics in Edmonton for avalanche, weather, road conditions and more as produced by Environment Canada, the Canadian Avalanche Association, Parks Canada, the Alberta Government, the Alberta Motor Association and others.